So if you read my product review for BiPro Strawberry the one, resounding message was that I’m not that fond of strawberry protein shakes. I must say…this might be the exception. And no I’m not just saying that because I love me some BiPro (although I do). I did actually, genuinely enjoy this shake! You guys! Do you know how much you have taught me about protein shakes in the last 8 years? Seriously. Since the publishing of The Bariatric Foodie Guide to Perfect Protein Shakes five years ago (yes, five!) you all have written in to me with a bunch of tips and tricks about protein shakes. And I’ve been listening! One thing you have to understand about my approach to shakes is that I came into the shake game in a very different place than it is now. Basically most protein powders were for bodybuilders (meaning high carb, muscle-bulking powders). There were a few companies that did protein for weight loss and their flavors were limited mainly to chocolate, vanilla and strawberry. I think that’s sort of why it was a godsend for me to find BiPro unflavored. I could change it into whatever I wanted it to be. S’anyway I say all that to say that my approach to shakes has been evolving. I plan to include some of that evolution in a refresh of the protein shake book (probably coming your way in 2017 but I know better than to tempt the gods after the zoodle book). This shake reflects well how my approach has changed. Simplicity! I’m all about it. At the height of things I had 36 bottles of various sugar-free syrups. (36!) I tossed most of them, mainly because they were way past expiration and I hadn’t even used half of them. I’m thinking of buying a few of the bottles that I absolutely love, but placing a cap on the number I can own (to like…three, maybe?). But simplicity is top of mind these days. What can I do to my shake with what I already have in my pantry? That’s where the inspiration for this shake cake from. Well…that and I love strawberry shortcake. The food. Although I also love the cartoon! This shake has just a few simple ingredients. The crux of this, though, is the sugar-free shortbread cookie crumble. Now don’t freak out about this, ok? It’s one cookie that you are crumbling up. Just one! The others you put someplace way up high so you don’t think about them too much. Or give them to your spouse. That seems to be a popular strategy. At any rate, this is a shake where I highly recommend using the Triple X Method to get a super-thick shake. Trust me, you’ll be glad you did! And of course I would be remiss not to tell you that the shake book has lots more ideas for how to make deliciously healthy, crave-worthy protein shakes that will ensure your weight loss journey is never boring. Get yours today! A protein shake for the perfect summertime dessert. 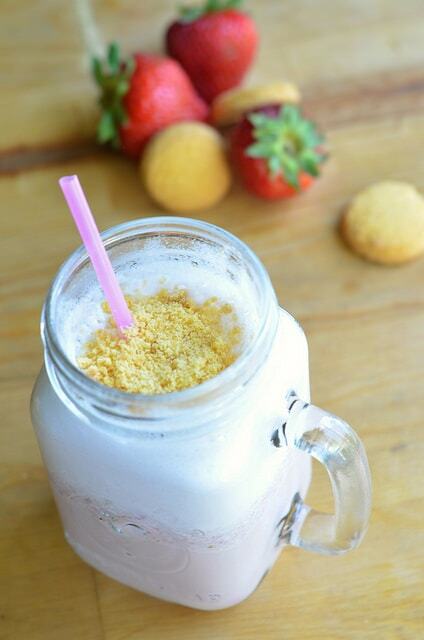 This shake features BiPro USA strawberry whey protein and few simple ingredients to create a desserty shake you can have any day you like! 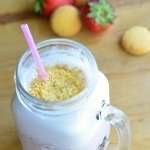 Combine milk, protein, vanilla, strawberries, and sweetener (if using) in a blender. Blend for a full minute. Add ice cubes and blend another minute, until smooth. Pour in a cup and top with cookie crumbles. You can also top with a dab of whipped cream, if desired.